The Reconstruction Era of 1865-1877: The nation attempts to rebuild following the Civil War. The years following the Civil War were marked by lingering bitterness in both the North and the South. Yet, the nation was faced with the monumental task of reconstructing the war-ravaged South, while grappling with the uncertainty of how to constitutionally readmit the rebel states into the Union, and to what degree, if any, punishment should be meted out for their secession. And finally, there was the humanitarian challenge of assimilating four million freed slaves into American life. This chapter focuses on what historians call the Reconstruction Era, generally recognized as the years 1865 to 1877. And, as you are about the discover, postwar events were heavily shaped by changes in the American monetary system. By late 1863, President Lincoln had clearly signaled his intent to deal mercifully toward the southern states should the North emerge from the war victorious. His views were aptly summarized in his "malice toward none, with charity for all" second inaugural address delivered on March 4, 1865. Lincoln believed the nation could most effectively bind its wounds through forgiveness. The former Confederates were not to be treated as secessionists, but as wayward family members who should be welcomed back into the fold with few conditions (keep reading, continues below photo). 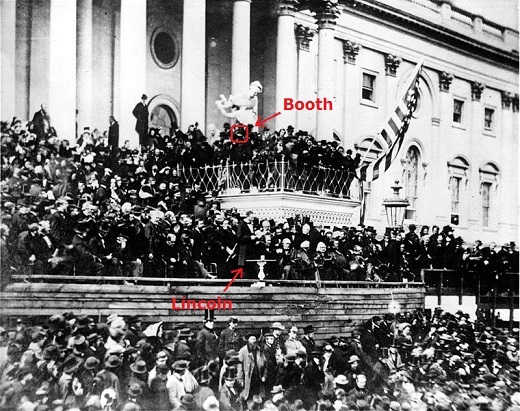 Thousands gather to hear Abraham Lincoln deliver his second inaugural address on March 4, 1865. Lincoln concluded the speech with these famous words: "With malice toward none, with charity for all, with firmness in the right as God gives us to see the right, let us strive on to finish the work we are in, to bind up the nation's wounds, to care for him who shall have borne the battle and for his widow and his orphan, to do all which may achieve and cherish a just and lasting peace among ourselves and with all nations". Many researchers believe Lincoln's assassin, John Wilkes Booth, was present that day, standing just above Lincoln. Other photos of the inauguration crowd give credence to this theory. Image courtesy of the Library of Congress. The president's plan consisted of two basic points: a full pardon for southern soldiers if they would pledge allegiance to the Union and promise to obey all federal laws and proclamations. High ranking Confederate officers, Confederate government officials, and persons guilty of war crimes were excluded from blanket amnesty consideration. 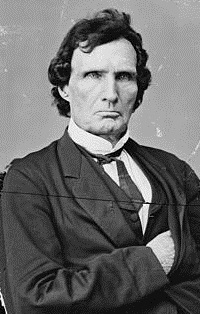 Thaddeus Stevens was a leader of the Radical Republicans during Reconstruction. He is considered one of the most controversial figures in U.S. history. Image courtesy of the Library of Congress. Secondly, any Confederate state could form a government and return a full congressional contingent to Washington after 10 percent or more of its voters in the 1860 election swore an oath to the U.S. Constitution. Lincoln's clemency policy was met with opposition by many within his own Republican Party. A loosely organized faction called the Radical Republicans, led by Congressman Thaddeus Stevens of Pennsylvania and Senator Charles Sumner of Massachusetts, wanted the South punished, rather than absolved. Among their goals was to diminish the political clout of the South by denying former Confederates the right to vote or hold office. They pushed for full citizenship rights for southern blacks, including access to the voting booth. The Radicals also clashed with Lincoln over the process of readmission. They asserted it was Congress, not the President, who had the constitutional authority to set the rules for returning the southern states to the Union. By the spring of 1865, the political battle lines were drawn sharply between President Lincoln and Congress over Reconstruction. A major confrontation was taking shape. 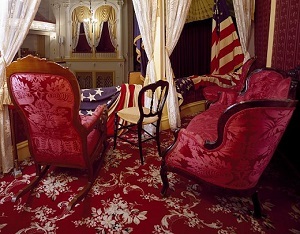 Lincoln Box, the box in which assassin John Wilkes Booth shot Abraham Lincoln during the president's visit to Ford's Theatre. Image courtesy of the Carol M. Highsmith Archive, Library of Congress, Prints and Photographs Division. This all changed on the evening of April 14, 1865, when President and Mrs. Lincoln attended a stage play at Ford's Theatre in Washington. A little after 10 PM, a former actor and southern sympathizer named John Wilkes Booth sneaked into the box overlooking the stage where Lincoln sat and shot the President in the back of the head. Booth leapt to the floor below and escaped. Lincoln was rushed to a house across the street but never regained consciousness. He passed away the next day. A few days later, Booth was tracked down to a barn in Virginia, but was not taken alive into custody. Historians have never conclusively determined if Booth committed suicide or was killed by his pursuers. Lincoln's sudden death shocked and saddened the entire nation. Many had looked to him as a wise, compassionate leader offering the best hope of rebuilding the country. That responsibility now fell to his successor, Vice-President Andrew Johnson. Andrew Johnson didn't learn how to read until he was an adult, and yet he rose to the U.S. Senate. Although he was a Democrat, Lincoln chose him as his VP running mate to attract Democrat votes. Image courtesy of Library of Congress. Andrew Johnson, a Democrat from Tennessee who opposed the Confederacy, was a self-made man of humble origins. One of his first orders of business as president was to announce he would support Lincoln's position of leniency. Johnson emphasized that any state could be readmitted if it would ratify the 13th Amendment to the Constitution (to abolish slavery), declare its secession illegal, and swear loyalty to the Union. The former Confederate states moved quickly to accept these terms. By late 1865, all of them except Texas had created new governments and sent Representatives and Senators to be seated in Congress, most of whom had been leaders in the Confederate cause. For a while, there was optimism that postwar America could come together peacefully. Could it be that Northerners and Southerners were going to sit down and together as Americans and determine the future course of the nation? 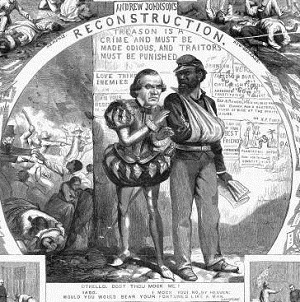 Cartoonist Thomas Nast derides President Andrew Johnson's lenient Reconstruction plan using a Shakespearean theme. Johnson is cast as the deceitful Iago betraying Othello, portrayed by a black Civil War veteran who is being denied justice in American political life. Image courtesy of the Library of Congress. Whatever hope there might have been evaporated when the Radicals blocked their return to statehood by refusing to seat these duly elected officials when Congress assembled on Dec 4, 1865. The southern House Representatives and Senators were left waiting outside the doors to their respective chambers. This action touched off yet another turbulent period in the nation's history. One important reason the Radicals blocked the southerners' entry into halls of Congress was the enactment of the odious "Black Codes" throughout much of the South earlier in the year. This topic is covered in the chapter directly below. The Radicals were also displeased the South tried to return to Washington under terms laid down by Johnson, since they believed it was the role of Congress to control the process. Many southern whites were uncomfortable with the sight of newly liberated slaves moving freely about the region. Others could not set aside their deeply held biases against the black race. 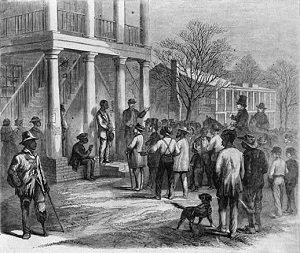 In response to their changing world, southern state legislatures attempted to resurrect the antebellum days by enacting the "Black codes". Florida's Black codes required any black who violated labor contracts to be sold for up to one year of labor. The above scene of a freedman being sold in Monticello, Florida was captured in Frank Leslie's illustrated newspaper of Jan 19, 1867. Image courtesy of the Library of Congress. Black codes varied by state, but all had the goal of controlling the economic and social lives of former slaves. The codes did recognize some rights for blacks that heretofore did not exist. The right to legally marry (but only to members of their own race), to own property, and attend school were new guarantees. In general, however, the codes were written to deny blacks basic civil rights. For example, blacks could not carry firearms, testify against whites, or start a business. Under the codes, blacks were subjected to a wide array of indignities designed to perpetuate a subordinate way of life for them. To the Radicals, the enactment of these repressive laws confirmed their distrust of white southerners to respect the citizenship rights of freed slaves. By prohibiting representation in Congress of the 11 former Confederate states, the Radicals maintained solid majorities in the House and Senate. Many northern voters supported the Radicals out of concern that hard fought gains of the war would be lost if the South were allowed to continue oppressing blacks without repercussions. Many in Congress felt it was necessary to enshrine civil rights for blacks in the Constitution, rather than pass laws that could someday be reversed by a subsequent Congress or overturned in court. In June of 1866, Congress passed the 14th Amendment and sent it to the states for ratification. The 14th Amendment made all persons born or naturalized in the United States (including black Americans) citizens of the country and of the states in which they lived. It forbade states to deny citizens of the rights of life, liberty, and property without due process of law, or to deprive any citizen the equal protection of the law. The amendment did not grant blacks the right to vote because that was understood to be something bestowed by the states. However, if any state prohibited blacks from voting or deprived them of any other rights as citizens, that state would suffer a reduction of seats in Congress. On July 20, 1868, Secretary of State William Seward certified the 14th Amendment had become part of the Constitution on July 9, 1868, when the necessary 3/4th of state ratifications was reached. States continued to ratify the 14th Amendment after its adoption. The final state to ratify was Kentucky in 1976. Image courtesy of Wikipedia User SnowFire via Wikimedia Commons. As a form of punishment for the rebellion, the 14th Amendment prohibited former Confederate leaders from holding public office at the federal or state level. Furthermore, it forbade southern states to repay war debts to anyone who loaned money to the Confederacy, or to be compensated for their loss of slaves. Connecticut was the first state to ratify the 14th Amendment, doing so on June 30, 1866. Many other states quickly followed suit. But the amendment could not muster the approval of the necessary three-fourths of the states to become part of the Constitution, primarily because all of the southern states, with the exception of Tennessee, rejected it. The Volunteer state was readmitted to the Union on July 24, 1866, less than one week after approving the 14th Amendment. With no clear direction on Reconstruction policy in view, the nation focused its attention on the congressional elections of 1866. 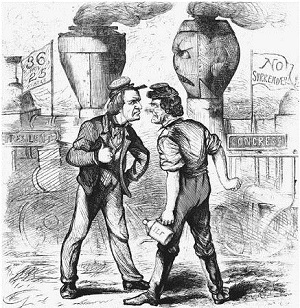 This cartoon summarizes the 1866 election as a showdown between Thaddeus Stevens (right) and Andrew Johnson (left). Both Johnson and Stevens are portrayed as railroad engineers of trains on the same track. Johnson says, "Look Here! One of Us has got to back." Stevens replies, "Well, it ain't me that's going to do it- you bet!" Public domain image. Voters in the 1866 congressional elections were faced with a choice: Vote for President Johnson's favored candidates in the Democrat Party and follow a path of leniency toward the South, or side with the Radical Republicans to bolster the harsh hand of Thaddeus Stevens and Charles Sumner. It was a rout in favor of the Radicals. By the time the final votes were counted, the Republicans controlled more than a two-thirds majority in both houses of Congress, meaning they had the power to override presidential vetoes. In early 1867, the Radicals pushed forward with their Reconstruction agenda. The 10 southern states that had rejected the 14th Amendment were divided into five military districts, each with an Army general in command. In all, 20,000 occupation troops were sent. Their duty was to maintain law and order in the war-devastated South. Each of the 10 states had to write new constitutions and organize new governments. The constitutions were required to grant black males the right to vote and hold office. Most former Confederate leaders were stripped of their voting rights and were not eligible to hold office. As a condition for readmission to the Union, the states were required to ratify the 14th Amendment. The South had little choice but to fall in line. The state governments formed under Johnson's plan were replaced by those obeying the terms put forth by Congress. 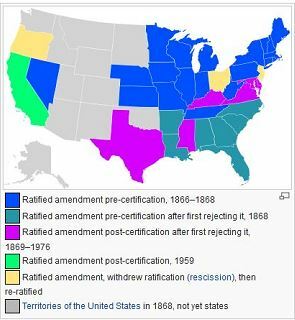 By summer of 1868, the 14th Amendment was officially added to the Constitution and all but three southern states had returned to the Union. The three holdouts were Mississippi, Texas, and, Virginia, but by 1870 these states accepted the congressional conditions and once again became part of the United States. Now that the Radicals had triumphed on Reconstruction policy, they still needed the executive branch, under President Johnson's control, to enforce the policy. Many Radicals did not trust the President to faithfully execute the law, and their suspicions were validated when Johnson used executive orders to harass the military commanders in charge of the occupation forces in the South. 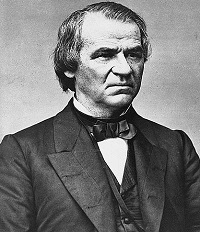 The impeachment trial of Andrew Johnson ran from March 5 to May 16, 1868. The ticket above was valid for admission on April 25. Image courtesy of Library of Congress. To retaliate, the Radicals sought a way to impeach and remove Johnson from the presidency. All they needed was an excuse to do it, and so in 1867 they passed the Tenure of Office Act. This law stipulated no president could dismiss a cabinet officer without approval of two-thirds of the Senate. Johnson, as well as many others, viewed this as an outrage, and decided it had to be tested. In February 1868, he fired Secretary of War Edwin M. Stanton, a Lincoln appointee who frequently sided with the Radicals. The House moved quickly to draw up articles of impeachment. One article dealt with the Tenure of Office Act . Another spelled out Johnson's rough mannerisms in working with Congress. Freshman senator Edmund Ross of Kansas cast the deciding vote to acquit President Johnson. The final vote in the Senate was 35-19 in favor of Johnson's guilt, one vote shy of the 2/3rds necessary to remove him from office. Ross' vote destroyed his political career, but he explained his vote had “saved the country from a strain that would have wrecked any other form of government.” Many scholars say he may have saved the presidency as we know it. Toward the end of his life, he won considerable praise for his courageous stand. Image courtesy of Library of Congress. Johnson's defenders claimed these charges were not what the Founders intended when they provided for impeachment on the grounds of "treason, bribery, or high crimes and misdemeanors". 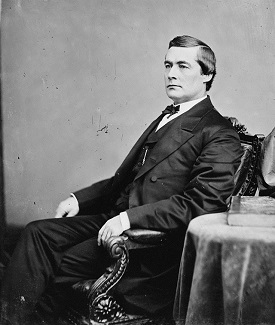 Despite the dubious nature of the charges, the House impeached Johnson on February 24, 1868. The Senate trial began in March and lasted many weeks. Fair minded observers came to conclude Johnson was not guilty of any crime for which he deserved to be removed from office. Yet, the trial went on, for what the Radicals truly wanted was to upset the co-equal balance of power between Congress and the Executive branch, set forth by the Constitution. It was their goal to make the President subservient to Congress. When the Senate vote was counted on May 16, it stood 35 to 19 against Johnson, just one vote shy of the necessary two-thirds majority required for his removal from office. Thus, Johnson served the remainder of his term, leaving office on March 4, 1869. He returned to his home in Tennessee, where he was chosen as senator in 1875. He died a few months later at the age of 66. 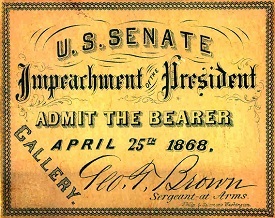 As the 1868 presidential election approached, the Republicans were feeling pushback from their overreaching attempt to remove President Johnson from office. In response, they nominated Ulysses S. Grant, the former general widely viewed as a hero for his successful leadership during the Civil War. Of secondary concern was the fact that Grant had no political experience, nor did he hold the fervent belief in equal rights for the freedmen as did many of his fellow Republicans. 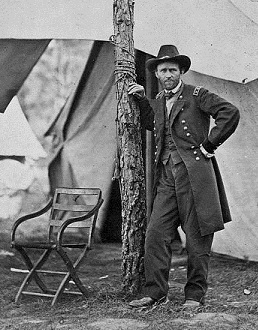 In one of the best known photos from the Civil War, Lt. General Ulysses Grant poses in June, 1864. About three months prior to this, President Lincoln promoted Grant to commander of all Union armies. Only two men had ever reached the rank of Lt. General. They were George Washington and Winfield Scott. Image courtesy of Library of Congress. Grant won the electoral college by 214 to 80, but his popular vote majority was only 309,000 out of 6 million votes cast. Had it not been for the new black vote that went overwhelmingly in his favor, Grant may not have won the election. Realizing their dependence on the black vote, the Radicals introduced the 15th Amendment. It mandated that no one could be denied the right to vote because of race, color, or previous condition of servitude. Most northern states prevented blacks from voting, so these states were affected as well. The 15th Amendment was added to the Constitution on February 3, 1870. Grant was an effective battlefield commander, but as a chief executive wearing civilian clothes, he had serious shortcomings. He was a poor judge of character, and appointed dishonest people to high positions of power, and yet was blind to their misdeeds. The prevailing ethos of the Grant administration spread like a cancer throughout the nation and became "business as usual" in many aspects of American life. Historians are quick to point out that although Grant surrounded himself with untrustworthy individuals, he himself was not personally implicated in any wrongdoing. Grant was easily re-elected in 1872. 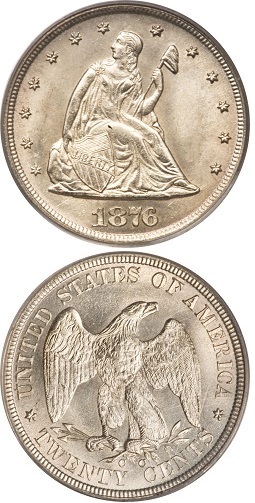 The 1870 pattern coin pictured above is one of the finest known surviving examples of the Standard Silver series. It's value is nearly $3000. Coin Photo courtesy of Ira & Larry Goldberg Coins & Collectibles, Inc., Beverly Hills, CA. As you have learned, corruption in government and private industry was commonplace during the Reconstruction Era. In keeping up with the times, some officials at the U.S. Mint could not resist the temptation to unethically pad their bank accounts with easy, fast money. Starting in 1869, the Mint experimented with silver coins of a lighter weight than regular coinage. Ostensibly, the justification for the program was that the lighter weight might discourage melting and the coins would remain longer in circulation. Durable coins seemed like a better alternative than the paper fractional notes in use at the time. These pattern coins were named the Standard Silver series, as was inscribed on the coins themselves. Mint officials realized an opportunity here. Instant artificial "rarities" could manufactured and sold to favored collector friends. It was easy to create all types of Standard Silver varieties, based metallic content and the presence or absence of edge reeding. Much of the coin striking was done in secret. Rank and file numismatists outside the Mint's circle of cronies protested this practice, but could do little to stop it. When one considers the dubious nature of their origins, it almost seems unfair today that Standard Silver series pattern coins can be valued at thousands of dollars. A two cent coin that few people used was being minted. There were two different three cent coins circulating, one made of silver and the other nickel. Ditto for five cent coins. Dollar coins were issued in both gold and silver. The elimination of the two cent coin, the silver three cent coin, the silver half dime, and the silver dollar. The silver content of the dime was increased by about 5%, to 2.50 grams. The quarter, and half dollar were increased likewise to 6.25 grams and 12.50 grams, respectively. This was done to place the U.S. in harmony with the silver coinage in Europe, hence the metric weight units. Authorized the minting of Trade Dollars. Placed the U.S. Mint under the jurisdiction of the Treasury Department. The Director of the Mint, who had been housed in Philadelphia since the Mint's inception in 1792, now was to take up residence in Washington, D.C. But there was much more. The Act contained mandates reflective of certain political and economic philosophies which proved to be far reaching. Before the Act, the U.S. used a bimetallic gold and silver standard to back its currency. The Act, in effect, moved the country to a gold standard only, by halting the government purchase of silver at a statutory price. Furthermore, no longer could anyone bring silver to the Mint to be converted into silver dollars. This cartoon appeared in The Daily Graphic newspaper edition of September 29, 1873. A frightening giant symbolizing the Panic is cleaning up Wall Street garbage, in the form of ticker tape. The debris being swept out include Rotten Railways, Shaky Banks, Bogus Brokers, and Living Deadbeats. Image courtesy of the Library of Congress. The Coinage Act of 1873 led to the reduction in the nation's money supply and a corresponding rise in interest rates, hurting borrowers intensely. This, in turn, generated doubt in the U.S. economy, convincing the investor class to avoid long term obligations, especially long term bonds. The chain reaction of events only got worse from there. For a number of years leading up to this point, there had been rampant speculation in the railroad industry and elsewhere. Many had bet their fortunes on its continued growth. One of the biggest players in the U.S. economy was a private investment bank named Jay Cooke & Company. Cooke had been trying to sell bonds for the Northern Pacific Railroad for the construction of the nation's second transcontinental railroad. By September, 1873, it became public knowledge Cooke was stuck with millions of dollars in unsold bonds. Its credit rating destroyed, Cooke filed bankruptcy on September 18th. Like dominos, other banks rapidly fell and businesses collapsed, followed by millions of job losses and a severe downturn of the economy. This period of turmoil was called the "Panic of 1873". It was one of the worst economic depressions ever to hit the United States, lasting for about six years. The Panic of 1873 ignited a new round of debate between the creditor and debtor classes. Each blamed the other for the financial misery the country was suffering. The caption reads "The lost traveller condemning the Post which points him the way." 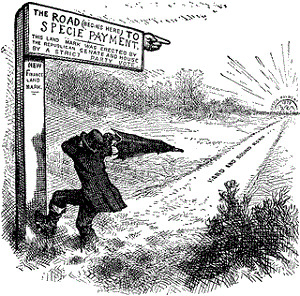 The signpost points in the direction of the dawning of 1879 specie payments, symbolized by the sunrise, with the sun being a gold coin. To get there, the traveller needs to take a "Hard and Sound Road". Public domain image. The creditors preferred "hard money"-- stable, non-inflationary paper currency backed by gold. They felt the best way to achieve this was for the government to resume specie payments (i.e. payments made in gold in redemption of paper money), something that had been stopped in 1861, when the Union sought to protect its precious metal reserves during the early days of the Civil War. In 1862, the government starting issuing unbacked paper money called "Greenbacks" that continued to circulate long after the war. Because the public had less confidence in the unbacked Greenbacks, they tended to lose buying power, resulting in inflation. In all, about $450 million in Greenbacks were distributed. Supporters of resumption contended the Panic would not have happened had the nation's paper money been backed by gold in the U.S. Treasury. Many who aligned themselves in this group stood to benefit from deflationary polices because their loans would be repaid with more valuable dollars, in essence generating a better rate of return on their investments, and driving interest rates ever higher. The debtors clamored for "soft money" -- unbacked, inflationary paper currency, a.k.a. "cheap money" and low interest rates. This would make it easier for them to repay their debts. They argued the Panic happened because there was not enough paper currency in circulation to maintain economic growth. They wanted the government to issue more Greenbacks, not retire them. Naturally, they opposed resumption of specie payments. In 1875, the Resumption Act became law. The Act required the Secretary of the Treasury to redeem Greenbacks in gold beginning January 1, 1879. Redemption of fractional notes (paper money with face values of less than one dollar) in silver began almost immediately. As the resumption date got closer, the value of Greenbacks rose. Coinciding with that was a slow improvement in economic conditions. 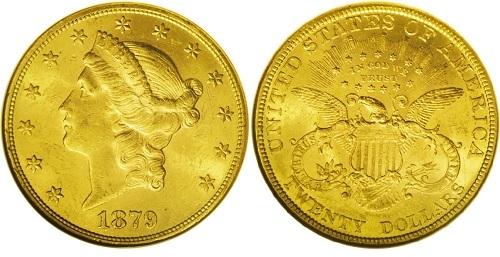 By late 1878, Greenbacks were worth their face value equivalent in gold. When the redemption date arrived, few people bothered to turn in their Greenbacks to the Treasury. This was another step in moving the United States toward a gold standard. 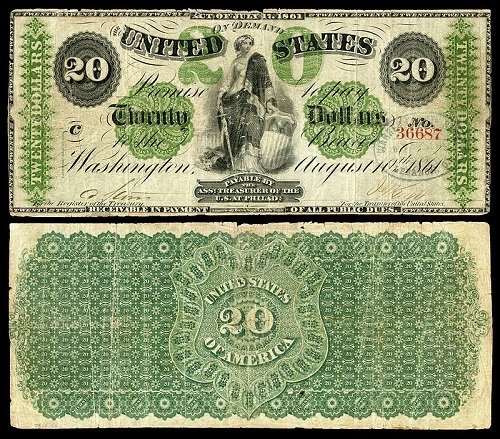 The top image is a $20 Greenback issued during the Civil War. The coin photos are of an 1879 $20 double eagle, that could have been exchanged for the same Greenback on or after January 1, 1879, according to the Specie Resumption Act. As January 1, 1879 approached, the public understood the Greenbacks were redeemable in gold coinage, so less than 25% of the Greenbacks were turned in. In essence, the Greenbacks became as good as gold. Greenback images courtesy of the National Numismatic Collection, National Museum of American History. $20 Double Eagle images courtesy of Heritage Auctions. 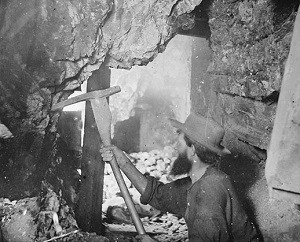 An unnamed miner in an unknown western silver mine. He and many others like him found a lot of silver in the 1870s. Public domain image. After the soft money coalition lost the debate over the Resumption Act in 1875, they developed a new strategy: push for unlimited mintage of silver coins from publicly supplied bullion. This was called "free coinage of silver". This strategy was connected to the fact that there was a very large amount of cheap silver flowing into the market following major silver strikes in western states throughout the 1870's. Silver producers were a major force behind this movement, for not only would Uncle Sam become their biggest customer, they also stood to receive $1 in face value coinage from the Mint in exchange for less than $1 in silver bullion. The net effect of these tactics would have been to depreciate the currency through inflation, which was the soft money coalition's objective all along. It was at this point the Coinage Act of 1873 received, belatedly, additional criticism. Recall, the Act prohibited free coinage of silver dollars from bullion brought to the Mint by the public. Although its detractors had to have known from its inception how the law read, a massive outcry ensued to denounce the Act as the "Crime of 1873". In reality, of course, there was no crime committed, but nevertheless, it became a rallying cry for the free silver advocates, who labeled themselves as "Silverites". Their support came from silver miners in the West, cotton farmers in the South, wheat farmers in the Midwest, and the Democrat party (keep reading below photo). Wheat farmers favored cheap, inflated money. They often had loans to repay for land, farm equipment, and supplies. They tended to side with the Silverites because massive infusion of silver could increase the money supply and cause inflation, making it possible to repay their loans more easily with cheaper dollars. 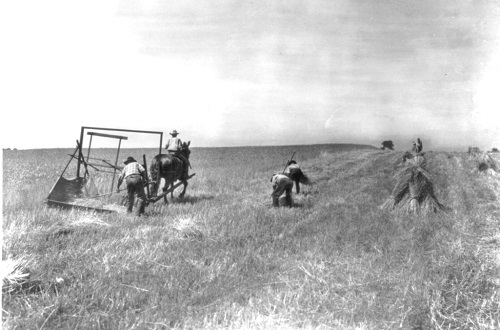 In the photo above, a mechanical reaper cuts the wheat quickly, but laborers are still needed to "shock" (i.e. bundle and stack) the wheat. Public domain image. Their opponents were the "Gold Bugs", made up of corn farmers in the Midwest, diversified farmers in the Northeast, creditors, and the Republican party. Many well-to-do inhabitants of eastern cities with ties to banks favored stable money backed by hard gold. A non-inflationary environment meant they could maximize their percent return on outstanding loans. Creditors were a crucial faction of the Gold Bugs. 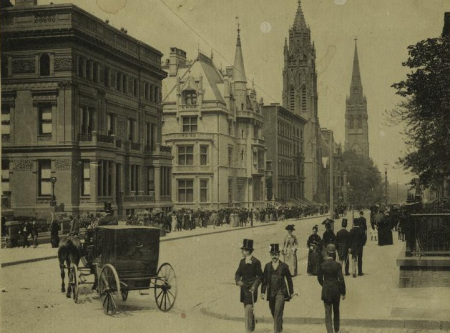 The photo above was taken on 5th Avenue in New York City sometime during the 1870s. Public domain image. This was the beginning of a very long, bitter struggle in American politics, continuing until well into the 20th century. On one side, there were the Silverites, always fighting for cheap, easy money, and higher inflation. The equally determined Gold Bugs believed gold backed currency and a stable dollar was the best prescription for the nation's economic health. As you will learn in upcoming chapters, it was the Gold Bugs who ultimately prevailed. 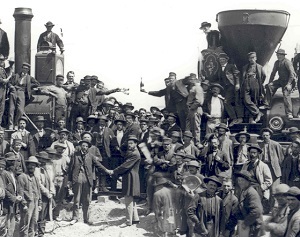 On May 10, 1869, a jubilant ceremony was held at Promontory Point in what is now Utah, to mark the completion of the nation's first transcontinental railroad. This accomplishment contributed enormously to the growth of the American West. With the new railroad, a journey from the Atlantic to the Pacific could be done in about one week. Previously, the trip required several months. Public domain image. While much of the nation's attention focused on postwar events in the South, the population in the American West was growing rapidly. As is usually the case, more people translates into greater demand for coinage. Large discoveries of gold and silver in the West (indeed, a major cause of westward migration) urged the Treasury Department into action. The cornerstone for a new branch mint was laid in September, 1866 at Carson City, Nevada. This location was close to the mines operating in the Comstock Lode, a fabulous silver deposit discovered in the late 1850's. By early 1870, the Carson City Mint was open for business, producing coins with the "CC" mint mark. Collectors of today are especially fond of Carson City coins, for their rarity and close association with the Wild West years. We have an entire section devoted to this history of the Carson City Mint. The Carson City Mint produced more than its share of rarities, but the 1876-CC Twenty Cent ranks near the top. 10,000 of them were struck, but most were melted down. Numismatists estimate there are 16-18 survivors. The example above is graded as MS-66 Uncirculated, worth about $500,000. Image courtesy of Heritage Auctions. The year 1870 also saw construction begin for the second San Francisco Mint. The first Mint building was opened in 1854, but it could not meet the explosive demand for coinage. By the summer of 1874, the second San Francisco Mint was occupied, touted as the largest coining facility in the world at the time. The ornate edifice was one of the few buildings to survive the catastrophic earthquake and fire of 1906. The "Granite Lady", as it came to be called, served ably until 1937. We invite you to visit our San Francisco Mint page to learn more about its magnificent legacy. The Twenty Cent coin commenced production in 1875, but lasted only until 1878. Both the Carson City and San Francisco Mints struck the ill-fated coin. The 1875-S Twenty Cent had a mintage of 1.16 million, almost six times the mintage of all the other Twenty Cent coins ever produced combined. Even though it is the least valued date of the Twenty Cent series, the 1875-S is priced at over $100 in Good condition. On the opposite side of the spectrum, the 1876-CC Twenty Cent coin can sell for half a million dollars. 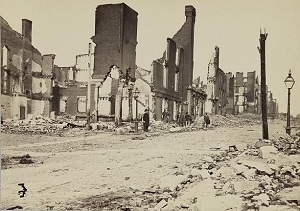 This April 1865 photo illustrates the war devastation of Richmond, Va., the capitol city of the Confederacy. Like Richmond, many places in the South were heavily damaged during the conflict. Image courtesy of the Library of Congress. Under the terms of the Radicals' reconstruction law, southern states were required to form new governments. The reconstruction governments faced enormous challenges in rebuilding large areas of devastation: many cities, roads, bridges, railroads, and factories were in ruins. Some individuals who participated in the formation of the new state governments came to be known as carpetbaggers or scalawags, and are forever connected to the imagery of Reconstruction. Carpetbaggers were northerners who migrated to the south after the war. Some arrived for humanitarian purposes and legitimate causes; others were opportunists motivated by greed. The nickname "carpetbagger" was derived from the vision that the newcomers carried their belongings in suitcases made of carpeting material, which were common in those days. Native-born white southerners who cooperated with the northerners were scorned as scalawags, a word synonymous with scoundrel. Like the carpetbaggers, some held the sincere belief their actions would help lead to good things. On the other hand, the top priority of more than a few scalawags was to enrich themselves unfairly at the expense of their fellow southerners. 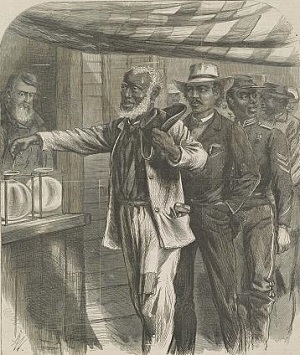 This image appeared on the cover of Harper's Weekly edition of November 16, 1867, depicting some of the first votes cast by black Americans. Following the close of Reconstruction, most southern blacks lost access to the voting booth. Image courtesy of the Library of Congress. For the first time ever, blacks were elected to federal office. This was aided by the fact that during Reconstruction, there were more blacks registered to vote than whites in the former Confederacy. In joining with carpetbaggers and scalawags, the freedmen formed a solid Republican voting block and held considerable political clout, but as you will see in upcoming chapters, it was to be short-lived. Of the 125 southerners elected to Congress during the Reconstruction years, 16 of them were black. The first to serve was Senator Hiram Revels of Mississippi, who was seated on February 25, 1870, but only after Democrats tried unsuccessfully to stop him from being seated. Ironically, Revels held the seat that once belonged to Jefferson Davis, the President of the Confederacy. Reconstruction efforts were plagued by widespread corruption. Much of the money raised through the sale of bonds and other means ended up improperly in the pockets of government officials and their cronies. In spite of this, there were notable improvements in the social conditions and infrastructure of the South. For example, new railroads crisscrossed the region, and the availability of formal educational was extended to large segments of the public, including blacks. The adoption of the 14th and 15th Amendments to the Constitution were also important advancements. But for every step forward in one area, new challenges arose elsewhere that would have to someday be addressed by future generations of Americans. Year after year, newspapers in northern towns and cities blared headlines decrying the chaotic conditions in the South. People who once followed reconstruction developments closely became weary of all the disappointing news. Not only that, northerners had financial and social woes of their own to worry about. This all was made worse by the lengthy economic depression that struck in 1873, spurred on by the Coinage Act of 1873, as you read above. Political pressure mounted to end reconstruction and focus on problems closer to home. 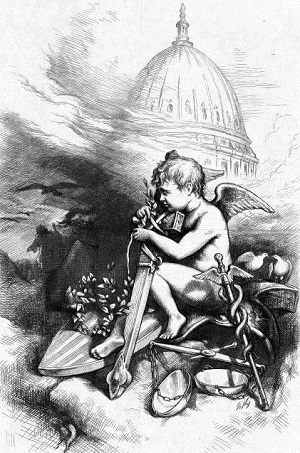 This symbolic-laden cartoon appeared in the March 31, 1877 edition of Harper's Weekly. 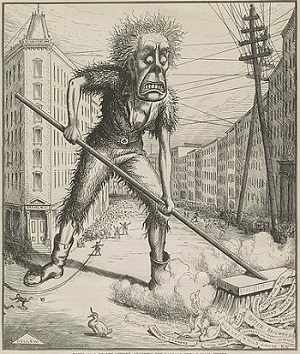 In the aftermath of the Hayes-Tilden disputed election and the Compromise of 1877 that ended Reconstruction, the cartoonist, Thomas Nast, radiates optimism. The cherub, representing a fresh start, wraps an olive branch around a sheathed sword. The scales of justice used in mediating the controversial election and compromise are abandoned, no longer needed. A couple of peaceful doves are perched behind the cherub. A snake, buzzards, and the angel of death are exiting. Finally, the fog of war is clearing to reveal the Capitol dome, symbolic of a republic that still stands. Public domain image. Republican Rutherford B. Hayes won the presidential election of 1876. His Democrat opponent, Samuel J. Tilden, actually received more popular votes, and may have carried the all-important Electoral College as well. There were 20 electoral votes in question, all of which were eventually awarded to Hayes. This happened as a result of a compromise between Republican and Democrat leaders. The Democrats agreed to stop contesting the election if certain conditions were met. Among these conditions was the withdrawal of federal occupation troops from the South. These terms were acceptable to the Republicans, and thus, Hayes became the 19th president of the United States. This agreement is often called the Compromise of 1877. In keeping his end of the bargain, Hayes' first major act as president was to order all remaining federal troops in the South to withdraw, leaving the old Confederacy and the freed slaves to fend for themselves. Historians generally concur the withdrawal of federal troops from the South marked the end of the Reconstruction Era. Return to the Coins and U.S. History navigation panel to study more chapters. 1 Bowers, Q. David. The History of United States Coinage. Los Angeles, CA: Bowers & Ruddy Galleries, Inc., 1979. 3 Daniel, Clifton, editor. Chronicle of America. Mount Kisco, NY: Chronicle Publishing, Inc., 1989. 5 Jordan, Winthrop D., Miriam Greenblatt, & John S. Bowes. The Americans. Evanstan, IL: McDougall, Littell & Company, 1988. 6 Taxay, Don. The U.S. Mint and Coinage. 7 Todd, Lewis Paul., Merle Curti. Rise of the American Nation. New York, NY: Harcourt Brace Jovanovich, Inc., 1972.